Of the many varieties of cancer which affect man, cancer of the larynx has an importance which is quite disproportionate to its frequency. In Great Britain it is not common, and indeed by world standards the incidence is relatively low. In men it amounts to approximately 1% of all cancers, but it is significantly less common in women, a feature which summons up thoughts of possible occupation based aetiology. It is not a homogeneous cancer, by which is meant it does not affect the larynx uniformly. The larynx is a complex organ, and its various discrete parts are affected with unequal frequency (again, by international comparisons, in a manner differing from some other parts of the world). 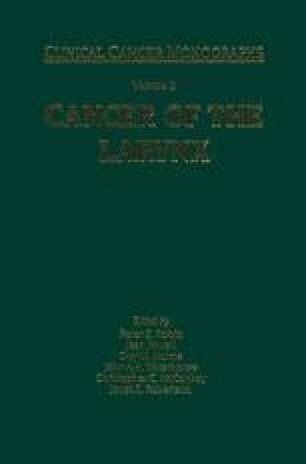 Cancers of the subsections of the larynx — supraglottis, glottis and subglottis, show variations in behaviour and in their tendency to metastasise. Some remarkable differences in metastasising capacity are portrayed.